Chef Michael Anthony and his team from Gramercy Tavern visiting the Dig Farm. A letter from our founder, Adam, on new funding from EHI, the growth equity fund from Danny Meyer’s Union Square Hospitality Group. I am writing today to share, with pride and gratitude, that we have new partners. Enlightened Hospitality Investments, the growth equity fund from Danny Meyer’s Union Square Hospitality Group, has made an investment in Dig Inn. Their investment is an incredible milestone for everyone who has been part of the Dig Inn community over the past 7+ years. Our new partners bring not only more capital to the table, but a best-in-class culture of hospitality and cooking that Danny and his team have cultivated for nearly 35 years — from Union Square Cafe, to Gramercy Tavern, to the now ubiquitous cultural icon, Shake Shack. Their unrelenting focus on their people, and their values, couldn’t be more aligned with our long-term vision for rebuilding the food system and changing the way we eat. The company that they are investing in today is very different from the one I took over a decade ago. We’ve changed everything from our name, to our menu, to our strategy for designing, building and operating our restaurants. Sometimes I wonder if we’ve been willing to try and fail too much, but it’s this relentless experimentation that has gotten us to where we are today. And there is still so much left for us to do. As we’ve grown and evolved, there are some things that have remained the same: our values, our passion, and our collective belief that access to good food — picked recently enough to enjoy its full set of nutrients, carried only as far as it needs to, grown and cooked by first names, and priced to feed a neighborhood — shouldn’t have to be a movement, an ethos, a privilege, or even a doubt. And this is why Danny and his team have now joined ours. 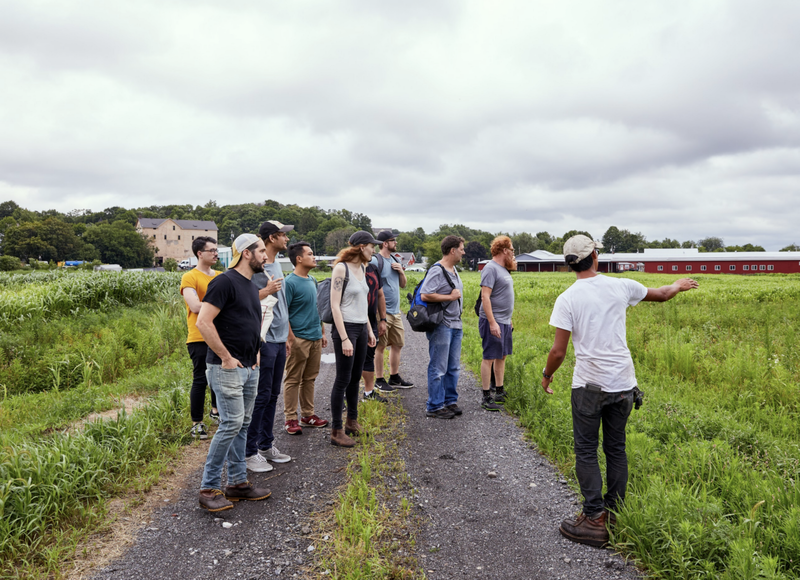 Our partnership began with a visit to the Dig Inn Farm with Chef Michael Anthony and his team at Gramercy Tavern — a day together out in the sun, planting seeds and talking vegetables. Before long some of our farm’s vegetables — eggplants, fresno chiles, bumblebee tomatoes, and leeks — made their way into Gramercy’s kitchen, and from there our partnership grew to where we are today. We will open more restaurants, like the ones you already know serving our food from the market-line, in New York, Boston, and our first in Philadelphia, the City of Brotherly Love. We’re focused on our people, food and farms in the northeast, so we’ll be keeping it local in ‘19. We will expand our new delivery service, Room Service, to first serve downtown, and then all of Manhattan. Look out for a different type of cooking — same ethos, same people, same vegetables — but a menu specifically designed for food that travels. We’ll open a different type of restaurant with a new dining format this year — the first of its kind for us — a neighborhood restaurant in the West Village where you will be seated at a table, served by a friendly person, and enjoy a delicious meal. We’ll hire another 300 men and women, many of which have never stepped foot in a restaurant kitchen, and teach them that knife skills are life skills, and how learning how to cook can change everything. We’ll supply our restaurants with over 8 million pounds of vegetables from the 80+ farmers that make up our growing community, including 100,000 pounds from our own Farmer Larry Tse, his team, and his newly launched Young Farmer Incubator Program. We still have much to build, vegetables to grow, and chefs to train, but with our new partners and your continued support, we feel so inspired and fortunate for the opportunity to do what we love. And it is all of you that I want to thank today. You have made this journey possible, and it is in your service that we continue forward. Thank you for giving us everything, and for believing that vegetables can change the world. Serving seasonal American food, mostly vegetables, sourced from farmers and partners as close to home as possible.